Forensic Analyst Clare Rosser has focused her career on becoming a detective and solving the mystery of her parents’ murder. When a series of grisly murders leaves bodies twisted and bereft of fluid in a mummy-like state, one fact becomes apparent: The monster that killed her parents ten years ago is active once more and killing again. Fighting the bureaucracy of her own police department, as well as her own prejudices and ailing body, Clare must take matters into her own hands before more suffer the same fate. The clues are out there. The answers lie within her. 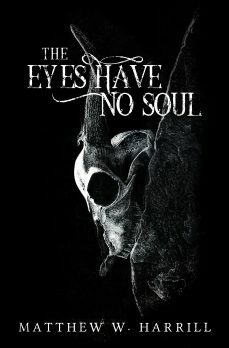 The Eyes Have No Soul is a supernatural whodunit that takes place in and around the town of Holden, Massachusetts. It is a tale that examines how deep one woman has to look for the strength to carry on in the face of a potentially fatal chronic illness. The closer she gets to death, the nearer she gets to the truth. The novel is aimed at readers who enjoy books with a strong element of supernatural activity. Creatures out of South American lore come to life as the politics of a highly-corrupt police department threaten to derail all attempts at finding the truth; someone is protecting the killer. No matter how hard Clare Rosser tried to escape the house of her birth in the sleepy forest town of Holden, Massachusetts, life kicked her in the guts by drawing her back. It had only been eighteen months. Freedom had been hers at last. Clare, with all her determination and drive, had sworn that she would get out of Dodge. Yet here she was, in her sophomore year, being dragged home in order to mitigate another disaster. She just could not escape. The trouble was she had no idea exactly what she was returning to this time round. Only hours before, Clare had been watching an old John Wayne flick with her friends and boyfriend. One phone call later, she had hurtled down route 90 from her rented house in Brookline, Boston, to deal with the latest drama. Was Mom ill? Had Dad drunk himself senseless again? Nobody would say. Clare gazed at her blue-eyed reflection in the rear-view mirror of her Mini Cooper, a car given to her by her parents as a sweet sixteen present, and four years later the only item from them she treasured. Dad had imported the shell and restored the car to perfect working order, painted it red with twin white stripes on the hood and delivered it to her with a bank of blinding headlights attached to the front and a full tank of diesel. Never mind that it was a petrol engine and had to be fully drained and cleaned before she could take it out. “Yes I know perfectly well who you are Julian. What’s going on?” Julian Strange had been the Rosser family physician for as long as Clare could remember. He had dealt with the fallout of her parents’ bouts of alcoholism with good grace, patient and informative. He was professional to the core when Clare had needed a father figure, sometimes impersonal, like he didn’t want to get too close. © 2019 Author Matthew W Harrill. All rights reserved.